Left to right are Alan Hicks, WestRock communications analyst, and Matt Smith, Alleghany County Parks & Recreations assistant supervisor. 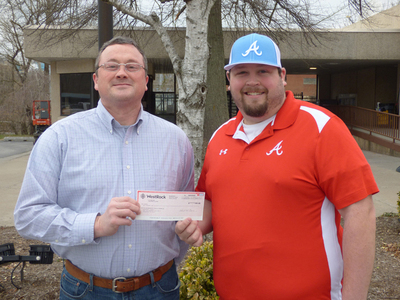 Covington, VA (April 12, 2019) - April 12, 2019ñ The Covington mill recently made a donation to the Alleghany County Parks and Recreation department to support Kids' Fishing Day. The Parks and Recreation department, in conjunction with the U.S. Forest Service ñ James River District, hold this event with the hopes of providing local youth with a great outdoor experience and leaving them with a better appreciation of the outdoors. This year will mark the twenty-ninth consecutive year that Alleghany Highlands youth will have the opportunity to enjoy fishing, spending time with family, and enjoying the outdoors. Kidsí Fishing Day is scheduled for April 20, at the Boys' Home. Registration begins at 8 am, with fishing from 9am - 12pm, and lunch provided after fishing. Many prizes will be given away during the event.